The LIBRARY GARAGE (151 6th Avenue North) and the METRO COURTHOUSE GARAGE (101 James Robertson Parkway) make up 2,042 spaces in the downtown Nashville parking inventory. The Nashville Downtown Partnership manages these Metro parking facilities, with an emphasis on customer service and making these facilities user-friendly. The Library Garage has an all day rate of $14 and a special event/nightly rate of just $10. Library patrons receive the first 1.5 hours of parking free at this garage with validation. The Library Garage is open 24 hours a day, 7 days a week, with easy access from either 6th Avenue North or 7th Avenue North. 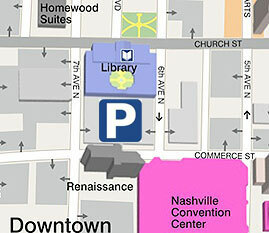 Within easy walking distance of the Ryman Auditorium, Bridgestone Arena, the best downtown restaurants and many other venues, the $10 rate is a great bargain for downtown Nashville parking (enter after 5 pm and leave before 5 am, Monday through Friday and always $10 on Saturday or Sunday). The Metro Courthouse Garage has an all day rate of $15 and a rate of just $5 on evenings and weekends. Exception: Tennessee NFL season game days and Nissan Stadium events are $10 - $15. The Metro Courthouse Garage has entrances on James Robertson Parkway and Gay Street. It is especially convenient for events at Nissan Stadium and Riverfront Park as well as 2nd Avenue and Printers Alley bars and restaurants. 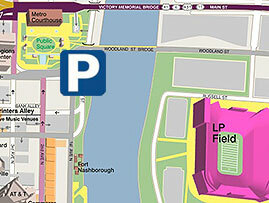 Special $50/month rate for nighttime parking (4 pm - 7 am). This rate is convenient and well-priced, especially for downtown residents and employees in the hospitality industry. Call 615-244-2330 to reserve a monthly parking spot.